Las Vegas, NV - Patriot Gold Corp. (PGOL:OTC) or ("Patriot Gold"), a gold and silver exploration and production company, today provided additional results from its ongoing reverse circulation (RC) drilling program at the Bruner gold project located in Nye County, Nevada. RC drilling at the Paymaster target area produced a number of drill holes (B-1457, B-1460, B-1458) which intersected good grade gold mineralization with high grade intercepts. B-1457 intersected 16.7 meters (55 feet) grading 9.94 g/tonne (0.290 opt) Au from 41.2-57.9 meters (135-190 feet). B-1460 intersected 7.6 meters (25 feet) grading 9.98 g/tonne (0.291 opt) Au from 53.4-61 meters (175-200 feet). B-1458 intersected 13.1 meters (43 feet) grading 5.13 g/tonne (0.15 opt) Au from 42.7-55.8 meters (140-183 feet). Additional drill holes hit significant but lower grade intercepts. The gold bearing zone at the Paymaster target area is a geologic environment that has thus far been rarely tested. "We are pleased to see our ongoing drilling program for the Bruner project result in the discovery of a new gold zone in the Paymaster target area, an area that has never been adequately drill tested in the past given its geological challenges," said Bob Coale, CEO of Patriot Gold. "This latest discovery of several high grade intercepts in this target area continues to drive our drilling efforts into 2015 as we further expand our mineralization resource outlook for the Bruner project. We are encouraged by our findings and continue to believe that the Bruner project is one that has significant long term value for our partners and shareholders." RC drilling at the Paymaster target area has intersected good grade gold mineralization in numerous drill holes. Drill hole B-1457 intersected 16.7 meters (55 feet) grading 9.94 g/tonne (0.290 opt) Au from 41.2-57.9 meters (135-190 feet). Drill hole B-1460 intersected 7.6 meters (25 feet) grading 9.98 g/tonne (0.291 opt) Au from 53.4-61 meters (175-200 feet). Drill hole B-1458 intersected 13.1 meters (43 feet) grading 5.13 g/tonne (0.15 opt) Au from 42.7-55.8 meters (140-183 feet). Additional holes hit significant but lower grade intercepts as noted in the table of intercepts. The gold bearing zone at the Paymaster target appears to be relatively flat-lying at the base of the felsic tuffaceous section, immediately overlying unmineralized andesite. 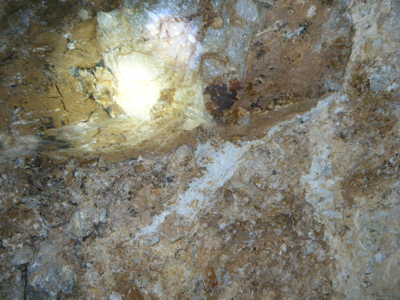 This is a geologic environment that has rarely been tested before on the property because it was too deep in the historic resource area or at the Penelas East new discovery area to be reached by the drilling completed to date. True widths of the reported intercepts appear to be roughly 70% of the reported drill widths.